User ID Password Forgot your password? Click an item to learn more. "This software has enabled us to do far more business with less employees." "This is the greatest software ever written. It is perfect for my business." 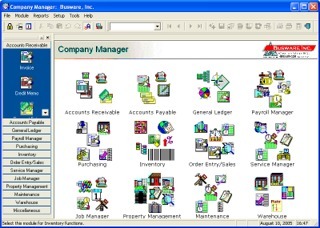 Our Company Manager software is our flagship custom software product, designed to assist small business owners operate and manage their business. Each package is individually designed and set up for your business, ensuring a perfect fit. The Company Manager consists of the modules listed above, each designed to work with one another to provide seamless integration. Modules and features not applicable to your business are hidden from view. The Company Manager is well suited to companies that have item sales, provide services, require inventory, or use serial numbers. In addition to standard accounting modules, the Company Manager handles sales, point of sale, purchasing, serial numbered inventory, service and job management functions. Let us help you automate your business with our expertise in business programming, ensuring you are more productive than your competition. In today's competitive environment, companies are striving to increase productivity. As a nation, we are accomplishing that by streamlining workflow, making employee tasks more efficient, and limiting paperwork and duplication. Not only will the Company Manager help with the task of increasing employee efficiency, it will measure it. We think you will agree that our software provides the best value for your company.